So I've got a Tibook with a dead DVD drive and I'm trying to figure out whether out there's any possibilty of the cause being software or logicboard related, because I've since replaced the DVD drive with another drive (I installed it myself) and It eats discs worse than the last drive did. OK. Here's the situation. 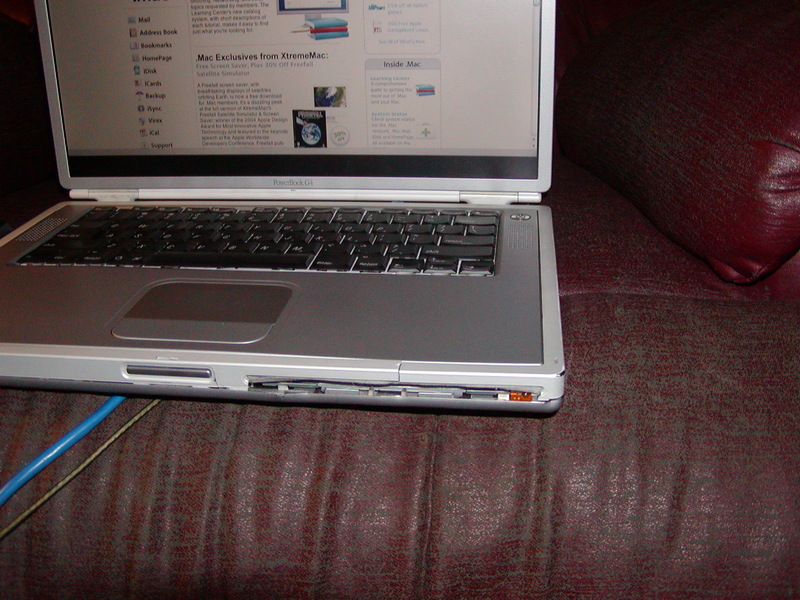 FIrst I'll mention that I tried/am trying to put up a site with pictures of the Tibook so that the damaged state of it can be seen for those who might be interested in the issue. Anyway. I have a 17" Aluminum and a 15" Tibook, and I use the Tibook as a backup system for the Tibook, here is a quick break down of the two laptop systems. The hard drive on the Tibook was replaced from a 10 gig that died on me. When it died, I installed the 100 gig from Seagate, and formatted/installed the system, then transferred over from the 17" my /User directory to sync up the two. About a week and a half ago... and I'm afraid you're going to have to forgive me because I can't remember what was missing, but I decided to run a system install as an upgrade because a piece of software was missing that I wanted from the system set. I believe due to my error. What happened, though was that during the second install CD, the installation stopped recognizing. I got the disc to eject, but the second time I tried the disc I heard a clicking and grinding and when I finally got the disc to eject, the disc had a crack in it. , though I learned this lately, because this was my first dealing with ebay, unfortunately. What I'm wondering, though, is if this could be a problem with my logic board, and if my Tibook is up the creek? So I think that's about it. I completely forgot why I started the reinstall!!! OK!! So I had problems with my cardbus slot not recognizing (turns out that it wasn't connected), and someone suggested that I go through the steps to reset the PMU. I went to the link that had instructions to reset the PMU, and after I followed the instructions, my computer completely hung up on the grey screen. Zilch, nada. THAT's why I went into the install/upgrade. I guess I should have just tried to wipe the whole system and install anew, but I wanted to save all the files I had on there, and I thought that the upgrade option would work well. (maybe I should have opted for archive and install) But now I've got a DVD drive that eats discs, could there be a relation? The case of that thing has a huge crack above the drive, this may be a factor, possibly bending the DVD drive and making it scratch discs? That's probably what's wrong. Trying another DVD drive could fix it. I've been very careful with moving the beater, and it worked for months with the crack with no problems, though that crack happened from a dog running past and snagging the ethernet cable, which could have started any number of problems throughout the computer. The new DVD drive hasn't been in it more than a few seconds and was in perfect alignment before it started eating the discs. I do have a replacement case on the way though, which should fix the cosmetics. Does an external DVD drive work?